Lately these three objects above have grasped my attention. The wooden wild cat which was given to me as a present from Argentinia, the carvings on the broken deck by Barcelonian illustrator Rotor and the Monster Dice book holder by Los Angeles based Geoff Mcfetridge. All of them have one thing in common what made me curious about them: They are all wood burned. It is a very simple, basic and ancient way to decorate things and consists of burning design into wood or other material by using a heated metal in any form (tip, poker or some wire tool) – called pyrography (writing with fire) or pokerwork. This basic technique got eventually updated by modern solid-point tools and I think we could call laser-etching the most recent way of burning wood – even if adepts might not agree. True, laser-etching takes a lot from the rough touch of the other tools and seems to be a lot easier in terms of mastery. Interestingly though, wood burning really seems to be stuck in the low culture – high culture devide as it is unconditionally linked to the label “folk art”. Still alot of the works done with this technique is by indigenous people (think of aboriginal art for instance) but it also became a hobby art/craft as newer techniques surfaced. Chairs, tables, boxes, spoons and figures are decorated with it or it is used for drawings mainly depicting portraits or wild animals like eagles, wolves, deer or bears. Laser-etching seems to have opened the idea of burning wood to more “fancy” applications. As I see it, Refill 7 Mag from Australia are the first ones to have used this modern version of wood burning on skateboards in 2007. They asked artists and designers like Delta , Jim Phillips or Marok to work together with them and created 67 decks which were first exposed in Syndney and then travelled to Tokyo. Here’s the flicker set of these decks as well as a youtube video of the opening of the exhibition in Sydney. In the meantime there are a couple of companies around which use laser-etching for boards. 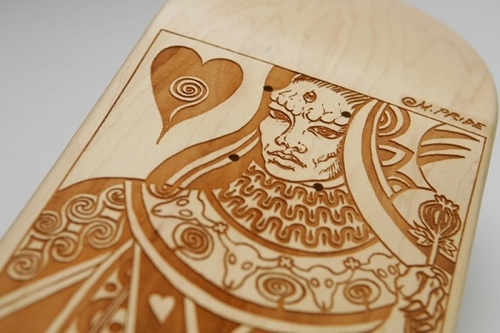 Totemdecks from Australia is one of them who specialized in manufactureing laser engraved decks while occasionally working together with artists. Speaking of the low- and high culture devide, I should mention the deck by Totemdecks done together with Alick Tipoti, an indigenous artist, which got purchased by the British Museum in 2008. Again, I wonder what these decks would look like if they are scratched by usage and get the raw spirit of original wood burned art back. 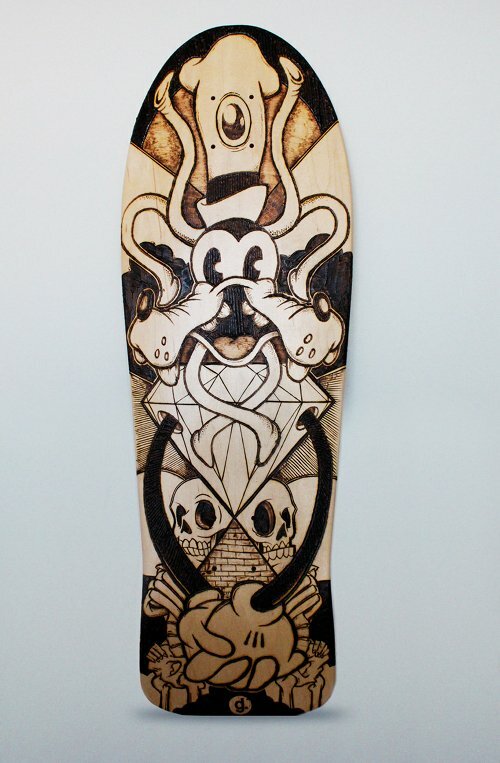 Therefore I’ll wrap this up with a real wood burned deck by Darryl Graham, a Toronto based illustrator. He learned this technique from his grandfather and applied it on his deck. Insightful post, laser etching looks great.